With boutiques and fashion houses sprouting up like mushrooms all over the city, it is no surprise that one might actually go berserk when looking for the right place to shop! Moreover, since quantity does not necessarily mean quality, it is also really difficult to find something you actually like. However, there are a few places, now and then, that come up with stuff that will make you sit up and take notice. One such place that is definitely worth checking out is Kankon's Boutique. 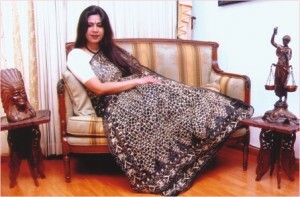 Multi-talented owner and designer, Afsana Rahman Kankon, who is also an artist and Rabindra Sangeet singer in her own rights, has only just started Kankon's Boutique, and already in the course of one month with a limited stock, she has received enthusiastic ravings from her clientele. Encouraged by such overwhelming support, Kankon's Boutique has very recently launched its first line at Price House on the 29th of last month. The line consists of all types of outfits, from fatua to shalwar kameez, but, anyone who goes through their products will undoubtedly agree that the highlight of Kankon's Boutique is their wide rang of exclusive designer saris. The fabric that they have used for the saris is mostly muslin, along with a few in silk, crepe and chiffon as well. Each outfit consists of exquisitely designed embellishments that include embroidery, cutwork, appliqué and zardosi. The boutique also emphasises on jamdani, and they have created many a masterpiece by experimenting with its unique design. To retain the exclusiveness of her products, owner Kankon sees to it that each design comes in only very limited numbers, such as three to four. She also takes pride in mentioning that all materials that are used in creating her products are 100% deshi. From fabric to trinkets and embellishments, Kankon's Boutique makes it a point to highlight our local products. Apart from clothing, Kankon's Boutique also has a small rage of bedroom items such as bed sheets, bed covers and pillowcases. Kankon's Boutique first started out with only a handful of workers. Now, within just a month, they employ a team of a hundred skilled and efficient workers, who contribute greatly to the making of all their exclusive products. However, in the near future, owner Kankon also wishes to move on to designing jewellery, shoes and other accessories that complete the ensemble. With a reasonable enough price range of Tk 4000 to Tk 25000, Kankon's Boutique is definitely worth checking out! Kankon's Boutique: House #17, Rd #96, Apt #A2, Gulshan 2, Dhaka- 1212; Address 2: Price House (1st floor), Pragati Sharani (on Bishwa Road). # 8854848, 01711593354. HARDLY a day goes by without more shocking statistics on the state of people's health and fitness. We all know we should be doing more exercise and most of us want to, but somehow life has a habit of sabotaging our best intentions. Let's face it, there is always a reason not to start: too tired, too busy, too overloaded with work. But we would like to show people that getting fit doesn't have to be all hard work and no fun. So, I am inviting all of you -- and your partners, friends and children, to get moving- literally. Halve your risk of stroke and heart disease. People who are fit and active have around half the risk of cardiovascular disease of unfit, inactive people. Cut your risk of breast cancer by up to 40%. Help control your weight permanently. The US National Register of those who have managed to maintain their weight loss in the long term shows that regular daily exercise is a key component in helping people control their weight. Reduce your risk of type 2 diabetes -- regular exercise lowers your risk of developing the condition by up to 64%. Help control your blood pressure and improve cholesterol levels. Help keep your bones and muscles strong and your joints flexible. Halve your risk of developing colon cancer. Boost your self-esteem, improve your mood and help protect against depression and anxiety. Get your whole family fitter -- only half of 11-16-year-olds walk for 10 minutes a day. Wear loose, comfortable clothes -- a few thin layers are better than one thick one. Choose comfortable shoes -- our walkers are wearing Asics trainers. Don't buy by size but by how they feel. They should be roomy enough for you to wiggle your toes but not so loose that your feet slide around. Do a posture check. Position your feet properly -- if you draw a line down the middle of your knee cap it should extend out over your second toe -- and ensure your weight is evenly distributed. Stand straight, with your eyes forward and your chin up. Let your shoulders fall down and slightly back, and pull in your stomach. Warm up with shoulder rolls, side bends and full body stretches. Add a few squats and knee lifts, and march on the spot. After exercise, repeat your warm-up in reverse, decreasing the size of your movements. Get your technique right -- your heel should hit the ground first and you then roll through the step from heel to toe and push off with your toe. If you're new to exercise, consult your doctor first. Cut the tops of tomatoes and set aside. Scoop out the centres of the tomatoes, then turn them upside down and leave to drain. Meanwhile, chop the apple. Put the apple in a bowl, sprinkle with orange juice and rind, then add the remaining ingredients except the lettuce. Divide the mixture equally between the tomato cups. Arrange lettuce leaves on individual serving plates. Place a tomato on each plate and top with reserved lids. Serve cold. Cut each bean curd into 10 pieces. Heat oil, add the chillies & fry briskly for 30 seconds. Discard chillies. Add the bean curd and fry for 3-4 minutes until golden brown. Set aside. Mix chicken and corn flour together. Tear lettuce leaves. Heat stock. Add chicken and stir until evenly mixed. Add lettuce, soya sauce, spring onions, prawns and vinegar. Cook for 2 minutes. Add the bean curd and serve hot. WHAT is beauty without clear, blemish free skin and what is clear skin without the aid of a quality skin care product that suits you and one you can trust? Until recently, finding that perfect cream or lotion, was a challenging task. Moreover, once you did manage to find one, the next phase of the challenge would be to get hold of it! That is because most foreign brand products are not always available here at a steady pace, and so you have to go through the hassle of getting a friend or relative who lives abroad to send it for you. Not only is that very, very time consuming, it can also tug on your wallet a good deal! Not to mention, your skin has to go through the entire ordeal of going without proper nourishment for the time before you get hold of a replacement. Fortunately, all that can be put behind us now with CMYK, an international brand of skin care and beauty products, which has been recently launched in Dhaka. The CMYK range offers an entire series of quality products that include anti-aging creams, acne lotion, as well as skin serums and many, many more. With Farzana Shakil, one of the country's leading beauticians, as their brand ambassador, one doesn't need to think twice about the quality they have to offer. A skin expert from CMYK, Liliana Turatello, is also available for consultations at the Dhanmondi branch of Farzana Shakil's Makeover Salon, where anybody can book an appointment and get answers to any and every query regarding the skin, as well as have other skin treatments, such as fillers and peels done. Consultations can be obtained through appointments, which must be made ahead. According to Farzana Shakil, the skin is the most important part of beauty and it is essential to have beautiful, blemish free skin, because that is undoubtedly the highlight, even if one has a good facial structure. There are certain free radicals, such as sun, pollution, and eating habits that do take its toll on the skin. Then there is also the age factor, which is inevitable, but we can, however deal with that by taking good care of our skin and good quality skin care products can actually help slow the process of ageing. Good skin appeals to everyone and although the price of CMYK products may be a little on the high side, it is a sacrifice worth making because the well being of your skin is something you can't put a price on. RECENTLY, British Council has organised a week-long workshop titled “New Silk Road Design Workshop, Part 2” at Jute Diversification Promotion Centre (JDPC), 145 Monipuri Para, Tejgaon, Dhaka where 20 Bangladeshi designers and product manufacturers specializing on jute and bamboo took part. This workshop is the 2nd of its kind which is organised under British Council's New Silk Road regional project. The aim of this project is to promote arts and culture of its region, Central and South Asia, which consists of Bangladesh, Nepal, Pakistan, Afghanistan, Iran, Kazakhstan and Uzbekistan. Through this workshop, the participants were able to explore the wider possibilities to enhance the usage of jute and bamboo made crafts and household items.